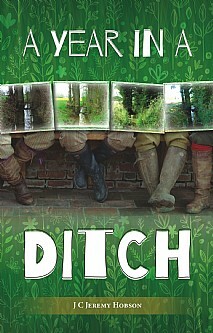 Explores the world of ditches – prepare to be surprised! 77 photos and 40 information boxes, colour throughout. Rivers, canals and Britain’s glorious waterways are championed and admired at every opportunity. They are the subject of countless photos, television programmes and books – and are places to visit and enjoy whenever considering a walk in the countryside. Sadly, not so the humble ditch; yet they are the all-important capillaries supplying the veins of our far more visual watercourses. Sometimes straight, sometimes meandering, they are essential in ensuring that water passes from its source and eventually to the sea with the minimum of disruption and damage to the surrounding land. As well as having a practical farming purpose and being important in preventing flooding, ditches are an essential habitat for many species of flora and fauna. Along their banks grow many native grasses and flowers and, in the water itself, there are likely to be an inordinate number of oxygenating plants plus threatened invertebrates. In no way a dry riverbed of hard facts, A Year in a Ditch is informative and a source of knowledge to anyone interested in exploring the delights of this vital habitat. Whilst discussing the role of the ditch past, present and future – particularly with regard to the flooding of recent winters – the book is full of relevant quirky notes and obscure snippets, the fanciful and factual; old wives’ tales; quotations and snippets of poetry. Ditches are an integral part of some very bizarre sports and pastimes indeed and there are even suggestions as to how one can actually dine out in a ditch! A Year in a Ditch will be a wonderful read for anyone wishing to know more about the 500,000 kilometres of these often-neglected waterways that have threaded their way through the British countryside for millennia. This fascinating book will appeal to those involved in countryside management, naturalists, environmentalists, rural explorers and anyone interested in wildlife, natural history and the countryside.